Silver halfpenny of Elizabeth I, (1558-1603). Obv: no legend; portcullis with hand above. Obverse description: Portcullis with hand above. Reverse description: Cross and pellets. Discovery circumstances: Found whilst metal detecting. A silver penny of Elizabeth I, (1558-1603). Reverse: CIVITAS LONDON; long cross over square shield. IM: hand. North no. 2017. 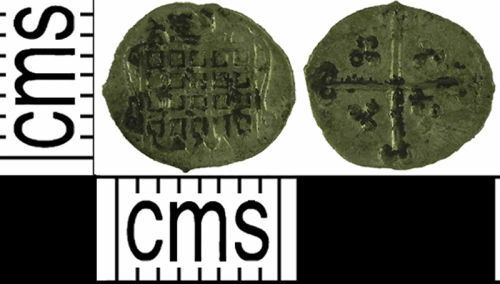 AD1589-1592.